my thermaltake soprano case has 3 stock fans, the front and rear ones have 3 cables coming out of it and the side one has 2. The 2 which are in all of them are a 4pin plug and a 4 hole plug, while the ones with a 3rd cable have a smaller 3 pin one. Can someone tell me which one is used for what? I heard that the 4 pin plug is for the PSU while the ones with the 3pin one goes into the motherboards system fan ports...is this correct? if so what is the one with 4 holes for? There are two types of fan connectors, Molex which is the same as IDE drives use, and 3 pin motherboard connectors (some CPU fans use a 4 pin connector similar to the 3 pin). Fans have either 2 or 3 wires the third used for speed sensing, with fans with 2 wires you can't moniter fan speed. 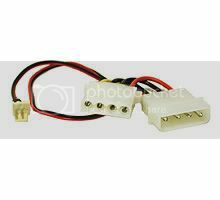 This is a picture of a 3 pin to molex adapter, it shows the two different connections. ah thanks about clearing that up, but are both of those 2 main wires used for power? and was i correct about the 3rd 1 having to go into the system fan part of the motherboard to monitor the speed? The three wires are red-power black-ground yellow-speed. The 3 pin connector will work on any of the fan headers on your board.